Cosmic Captain. Sails around the galaxy. Saving girls and boys from dangerous aliens. And making the universe a great place to be! Don't go Googling any of that. We might be pulling your leg, well, except for the part about this being an awesome costume. And we like the backstory, too. We think it really works! An intergalactic hero who's got a pointed collar and sleeveless tunic? Heck yeah, sign us up! 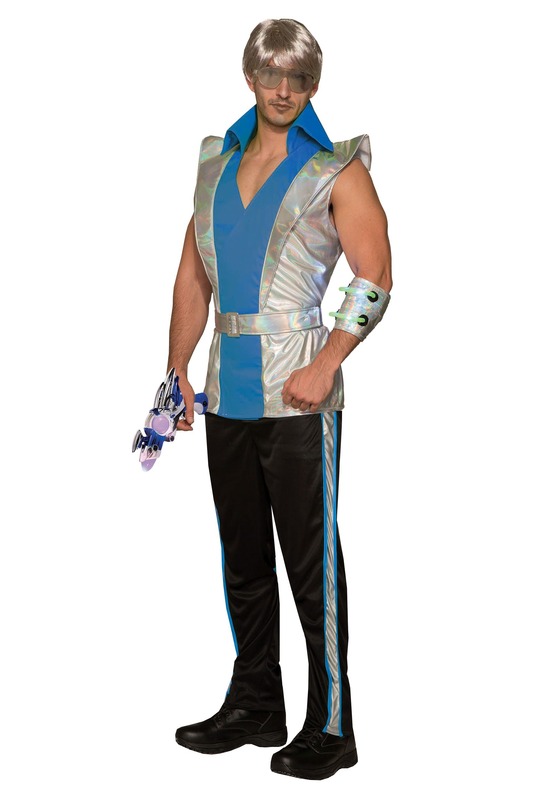 Of course, you can take up the mantle of the Cosmic Captain yourself, when you pick this costume. Saving the galaxy's all in a days work, right? This costume is just what's need for an interplanetary expedition. It comes with the tunic top, and it features a bold collar, v-neck cut, and shoulder accents. In shimmering silver and blue, it just screams intergalactic! The pants continue the theme with cosmic colored tuxedo stripes. And if you thought that was everything, well, that's not it. This costume also comes with a light-up arm cuff. You know, so you can make transmissions to your ship while you're on an away mission! Of course, you could just set aside the Cosmic Captain theme and go a totally different direction. A little body paint, a mask, and wham-o, bam-o you're an instant alien! Whatever kind of adventure you choose with this costume, we're sure it's going to be out-of-this-world. After all, the adventure's up to you!